Each one is with different size. 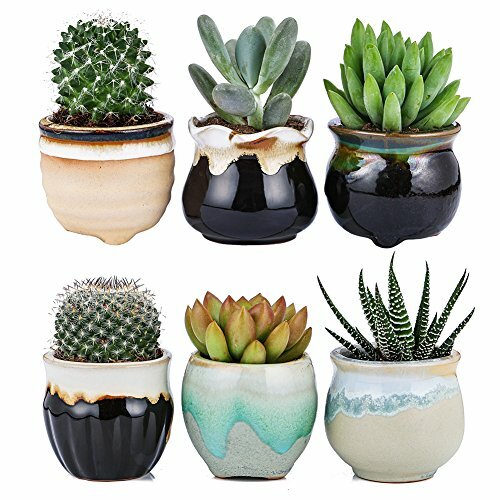 Plant your favorite succulents and other small plants and decorate your living space with this lovely small plant pots. The elegant, attractive color plant pot is suitable for decorating gardening,desk,bookshelf,dinning table,living room,hosting room and everywhere. This petite succulent pot set can searve business decor too to decorate your office,shop, hotels, studio,restaurant,bookstore,coffee bar and more places. It's a perfect gift for those who love succulents and small plants. You could easily add fun to gift by filled themwith plants,flowers or even with candy. Approximate Size: 2.25 x 2.25 x 2 inch (L x W x H).Each pots is with a small hole in the bottom. Ideal for adding a dash of refreshingly modern design to your home. Suitable for decorate garden desk,bookshelf,dinning table,living room,hosting room. It's also good choice for office,restaurant,coffee bar and other business area decoration. The ceramic pots bulk is perfect gift for family and friends who love succulent plants/cactus. Plant Pots only,plants are not included.Handmade products,color may vary.Buy with confidence,if damaged during shipping,we refund/resend for free. If you have any questions about this product by Jomass, contact us by completing and submitting the form below. If you are looking for a specif part number, please include it with your message.